Follow A Reinvented Mom on Instagram I want to join the fun! Disclosure: This post may contain affiliate links. When you click on a link and/or make a purchase, I may be paid a small commission at no additional cost to you. Please read my Disclosure page for more information. Find yourself short on funds for the upcoming holiday season? No need for panic! 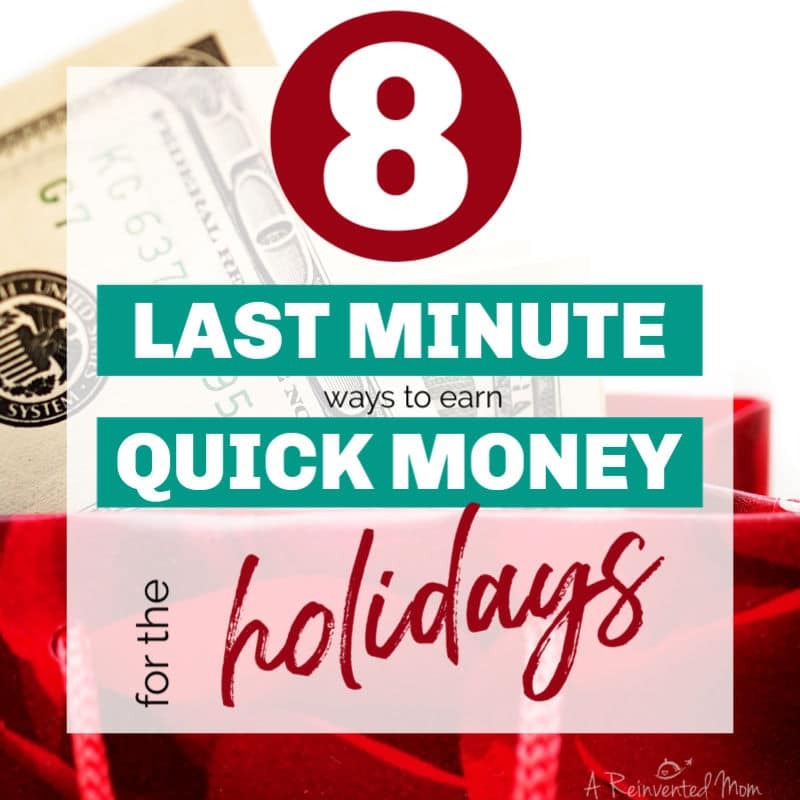 Check out 8 ways to earn quick money for the holidays and put a little extra jingle in your pocket. Anyone else panicking now that it’s early November? The Holiday season will be upon us in mere weeks. Are you prepared? Do you have enough money saved to purchase gifts? What about money for seasonal activities, travel and holiday entertaining? If you answered “No” to the above questions, don’t panic. 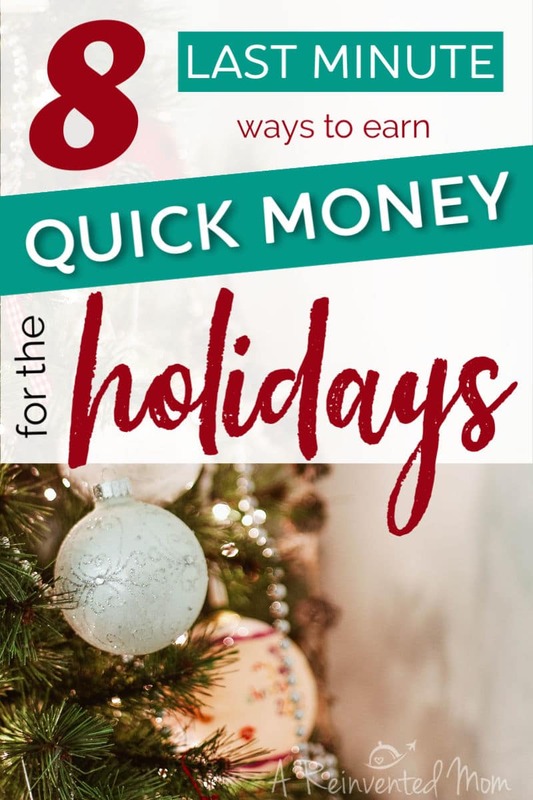 I’ve got a few suggestions to help you earn quick money for the holidays. Want to earn cash for shopping online? I use Ebates whenever I shop online. It’s a quick, easy way to earn a little cash. You’ll earn a $10 bonus for signing up and making your first purchase before 12/31/18. Unlike other “Last Minute Ways to Save” posts I’ve seen, these tips will offer you quick funding. With the potential to earn significant amounts of money. Taking online surveys, using Ebates and starting a blog can be legitimate ways to earn money. But the payouts can be small and take months to land in your bank account. And you don’t have months. Because you need money NOW, am I right? Just trying to keep it real friends. Take a quick look at your budget to see where you can trim expenses. If your budget includes funding for dining out or a daily coffee, now is the time to put those purchases on hold. Not forever, but for a few weeks. Pack a lunch for work. Brew a cup of coffee or tea at home instead of hitting up the coffee shop. Practicing a little restraint for a short time could result in a sizable amount of savings. Earn extra cash by driving and/or making deliveries. These jobs are very flexible and allow you to set your own hours. The more time you put in, the more cash in your pocket. Payments are made in a timely manner, making it an ideal option when you need cash quickly. Be sure to review the requirements and fine print to verify this opportunity is a good fit for you. Meet the flexible way to earn. Start driving with Lyft and earn a $300 bonus after your first 100 rides. Terms apply. Become an Airbnb Host to make a little cash by renting your home. You choose to rent your entire house or a single room. A couple of short stays could earn you a tidy sum for the holidays. The application process is straightforward. Payments are made 24 hours after your guest checks-in. Check out the requirements and fine print before proceeding with this option. Many retailers hire seasonal, part-time help this time of year. While the commitment is short-term, the payoff could be significant. Beside extra cash in your pocket, you may also receive an employee discount. This additional savings could be beneficial if it’s a store you shop regularly. Catering companies also look for seasonal help during the holidays. If Food & Beverage is in your wheelhouse, catering jobs can be very lucrative. According to Marketwatch.com, it’s estimated that almost $1 billion (yes, that’s BILLION!) in gift cards go unused every year. Mind blowing, isn’t it? I am guilty of “collecting” gift cards as well. While cleaning out a closet recently I found a bundle of cards with a value of over $200! My stash included a few Target and Amazon cards that I can use for holiday shopping or basic needs. If you have unused cards lurking in your home, decide if you want to redeem the cards yourself or sell them. I will be selling my unwanted cards through Raise. Payment, less a small fee, will process soon after the card sells. The opportunities are limitless. Many people are willing to pay someone to rake leaves, shovel snow, walk the dog and run errands. At $20-30 per rake or shovel session, the cash can add up quickly. Get creative. Advertise your services on local Facebook groups or Craigslist. Post a card detailing your services and contact information on your local grocery store bulletin board. One of my go-to ways to save quick cash is a Pantry Challenge. Pledge to stay out of the grocery store for 1-2 weeks. Plan your meals using food you have in the pantry, frig and freezer. A Pantry Challenge can easily yield a couple hundred dollars in savings. The amount you save will vary based on your grocery budget. Want to give it a try? Print a FREE Shop The Pantry Printable to take a quick inventory of food on hand. You can also read about my 2017 Pantry Challenge results for inspiration. If a Pantry Challenge seems too drastic, make a commitment to plan your meals for the next 2 weeks. Take a quick inventory of food on hand, and plan meals using the groceries you have on hand first. Take it a step further and plan your meals based on your grocery store’s sales flyer. I find that I can cut my grocery bill in half by simply making a meal plan and sticking to my shopping list. My Meal Plan Monday posts offer inspiration for easy, low cost meals. Do you have any tried and true methods to raise cash quickly? Please share your ways to earn quick money in the comments. I’d love to hear how you earn extra cash! Originally posted on 11/2/17 and updated on 11/19/18. Follow A Reinvented Mom on Pinterest, Instagram, Yummly and Twitter. A Reinvented Mom is a participant in the Amazon Services LLC Associates Program, an affiliate advertising program designed to provide a means for sites to earn advertising fees by advertising and linking to Amazon.com. Subscribe to our Newsletter to stay up to date. You'll receive exclusive content, the latest news and occasional special offers by email. Your information is safe & will never be shared or sold. Unsubscribe at any time. By subscribing to our Newsletter, you consent to receive exclusive content, blog updates and occasional promotional information by email.